Researchers at Carnegie Mellon University have created ingestible batteries, that could make internal devices a possibility. While wearable technology is bringing smart devices even closer to home, another emerging field is the development of electronics that actually sit inside our bodies. We recently reported on TruTag — ingestible nanoscale electronic tags that could help tackle pharma fraud — and now researchers at Carnegie Mellon University have created edible batteries, that could be used to power biodegradable devices located inside the body. 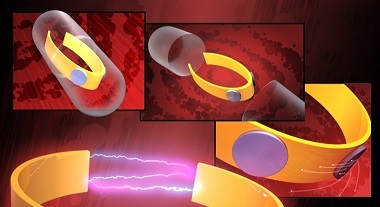 Developed by professors Christopher Bettinger and Jay Whitacre, from the materials science and engineering and biomedical engineering department at the institution, the idea stems from the need for a power source for biodegradable electronic materials that could have a number of medical benefits — timed drug delivery or health tracking, for example. The result is a non-toxic sodium ion battery that uses melanin derived from an organic material — cuttlefish ink. Since the ink is fairly commonly available, the cost of the edible batteries is low. The team says that the devices could be ingested in much the same way as a pill, without the need for prior sterilization, and any casing is biodegradable and deteriorates in the body. Combined with other technology, the batteries could have wide-ranging use — both medical and otherwise. In the near future, Bettinger imagines that humans could be taking his battery pills once a day in order to keep internal devices running. What possible inventions could be brought about thanks to this development? Tags: Carnegie Mellon University, Christopher Bettinger, Edible Batteries, Jay Whitacre. Bookmark the permalink.